FASHION Trend Report: Forescast for Fall. Back to the future (Pt 2). EATS Crazy for Cranberries; Tricked out Pumpkin Pie; Let's Talk Turkey; Green Bean Casserole Take 2; Top Taters. BODY Serenity, Now! ; Season to be Freezin'? ; Skinny Santa. WRITE Write On! Winners of our 2018 writing contest. EATS Our Best Holiday Dishes. Reader's all-time faves. STYLE Choose Your Sole Mate, Bold Holiday Makeup: No Grinches Here, Sleek and Shiny. BEHIND THE PAGES Liberate the Bra: Make It a No-Phone Zone. EATS Warm Inside and Out. One-pot meals for fast, easy dinners. STYLE Big Jewelry News, Hair Accessories Make the Cut, Hold Everything! BEHIND THE PAGES The Healthy N.C. State Fair – Really! FASHION Trend Report: Forescast for Fall. Back to the future. SAVVY The Writer's Red Carpet. Three women inducted into Hall of Fame. HOME Adventures in fostering dogs. One mom's story. BEHIND THE PAGES Play it cool. EATS A Twist on Mojitos, Summer of Love at Farmers' Markets, Too Many Tomatoes!, Pickle Paradise, Go Bananas for "Ice Cream"
TRAVEL On Location. See where TV shows and movies were made in N.C. RECIPES American Barbecue. Blazin' flavors from the grill. TRAVEL What a Melon! Oh the Places You'll Go. Dancing Under the Stars. EATS Hibiscus Tea, Cherry Picking, Grilled Cheese, Garlic Lovers, Grills. RECIPES Local Fish Tales. Triangle author releases "Carolina Catch." STYLE Jewelry, Up Your Sleeve, Statement Sunglasses. FASHION Color Me Happy. Spring runways are tickled pink - Part III. BODY Plant Protein, Prevent Running Injuries, Stressed Out. HEALTH Beyond PMS and Hot Flashes. Hormonal shifts affect your smile. STYLE Color Me Happy. Spring runways are tickled pink - Part I. FOOD Munch Madness. Quick and easy game-day grub. BODY Eat Slow Lose Weight, Down the Drain, Floss Like You Mean It. ARTS Win Big Prizes in our annual writing contest! EATS Healthy Soups and Stews. Good bowls that are good for you, too! BEHIND THE PAGES We're 25! 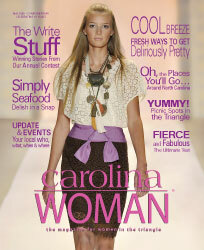 Carolina Woman magazine turns 25 this year! FASHION Shaping Up to be a Good Year. Accessorize Like a Pro. BODY Fitness Resolutions for Every Body. Wash Your Hands! Skin-Deep Beauty Tips. EATS Comfort-food Faves. Cooking for the Holidays. STYLE Pearl Jam. Go Bold with Accessories. Party Dresses That Fit...You. Make Sense. BODY Women and Weight. She ain't heavy, she's my sister. BEHIND THE PAGES Serenity Found. 30 Ways to Trim Holiday Stress. FOOD Local Farm-to-Table Eatery. Literally. She owns the farm.. STYLE Best in Boots. A Mixed Bag. Hats Head Into New Territory. BODY Pay Attention to Warning Signs. What to know about gynecological cancers. HOME Trick or Treat! Plants with freaky names, cool looks. STYLE Stay Chill. Use your wardrobe to keep it cool. TRAVEL Summer Weekends. From RDU, you can go anywhere! FOOD Farm Fresh Fruit With a Twist. A tribute to summer. ARTS Power of the Pen. Winners of our annual writing contest. FOOD Playin' With Fire. Blazing grub fresh off the grill. BODY Gotta Go! An uncomfortable but important topic. STYLE Spring Runway Report. Six wearable trends. FOOD Earth Day's Bumper Crop. Super delish meals to celebrate plants. BODY What Happens When an Old Broad Decides to Reproduce? I know what I'm talking about. I'm the old broad. BODY How Many Vices to Quit at Once? New research says: all of them! ARTS "Lift and Separate" A novel. EATS Baking From Scratch. How a passion became an award-winning business. STYLE Mingle Bells. How to dress for the holidays. BLISS The World in Focus. Staff favorites from our 2015 photo contest. EATS Back to Her Roots. The Latin-southern food connection. HOME Fall Colors. To decorate your four walls, buy directly from artists. BLISS The World in Focus. Winners of our 2015 photo contest. BLISS Hurry, Hurry, Step Right Up! N.C.'s blue-ribbon best. STYLE Fall Fashionista. Your comprehensive guide to autumn-wear. SAVVY Halloween Chic. From spooky to kooky, here are some tips! BLISS Joyride! Gas, grub and the Wild West. EATS The Spice of Life. Homestyle Indian fare wows Chapel Hill. SAVVY Divorce 101. The scoop from Raleigh experts. EATS Grillin' Fast & Easy. Summer dishes for your outdoor table. STYLE The Sunshine Report. Hottest trends in swimwear. HOME Backyard Retreat. Design trends for your private haven. UPDATE Extra Extra! Read all about her! EATS Farm to Fork. Fresh dishes for May gatherings. HOME Animal House. How to pick the right shelter pet. CONTEST The Power of the Pen: Winners of our 2015 writing contest. EATS The Spring Holiday Table. Easter and Passover dishes from recent cookbooks. EATS Slam Dunk. Championship bites for March mania. EATS Sweet Kiss of Chocolate. Desserts and drinks to share. EATS The New Healthy. Fresh dishes from around the world. BODY Lighter Side. The skinny on losing weight. EATS Eat, Drink and Be Merry. Jolly sides for festive dinners. BLISS They've Got The Write Stuff. Winners of our annual contest. EATS Farm to Table. It's market season! STYLE It's Beginning to Look a Lot Like Christmas. Ensembles for every occasion. EATS Fruitcake? Fuhgeddaboudit! Decadent desserts for the holidays. EATS Turkey Day Faves. Side dishes to gobble up. BLISS Announcing the Winners of the Annual Photo Contest. EATS Easy as Pie. Scrumptious from dinner to dessert. STYLE Fresh off the Runways. Must-have looks for fall. EATS Game-Day Dining. Food, fun and football. EATS Yes, Chef! The joys of cooking school. STYLE Dual Season Wardrobe. Five trends that make the shift. HOME Design Your Own Study. It's not kid stuff. HOME Top 10 Outdoor Trends. From luxe spas to backyard kitchens. EATS Backyard Revolution. Fresh grub to grill. EATS Picnic Perfect. Simple dishes for an outdoor feast. BLISS Mighty Pens. Winners of our annual contest. EATS Meatless Magic. Vegetarian comfort food that's fast and easy. STYLE Tough or Tender. Spring fashion forecast calls for extremes. EATS Go Global. Around the world in your kitchen. EATS Love Story. Romantic dinners for two. BODY You're a Sweetheart! Facts to make your heart race. EATS Comfort Lite. Healthy, hearty main dishes. STYLE She Wears the Pants. Powerful winter trends. HOME Drab to Fab. Use what you own! EATS I'll be home for...Sweet endings! BLISS See what's happening around the Triangle. STYLE Look Cool, Stay Warm! Wrap up in the latest coats. EATS Soup's On! Hot sips for chilly days. BLISS Annual photo contest winners. STYLE Arresting Autumn Apparel. Fall trends to catch your attention. BODY How to Win at Losing. Let your mind help your body. EATS Exploring the East. Go global in the kitchen. BODY Celebrity Fit Club. How Hollywood stars keep their glow. BLISS On-Air with Erica. An all-access pass to the life of a radio personality. EATS Show Off Your New Flame. Dishes you'll love! SAVVY Return of the Student. Choosing to continue learning. BLISS Things to do around the triangle. HOME Surf's Up. Beach renovation hangs 10! STYLE Fun in the Sun. Swimsuits that fit you. EATS Cinco de Mayo. Hot fare for a hot month! FOOD April Showers. Heavenly bites for baby and bridal parties. FASHION Express Yourself. Spring's top trends speak volumes. FOOD March Madness Munchies. Fast-break stars. FOOD A Chocolate Affair. From morning 'til night. HOME Romantic Retreat. Turn your bedroom into an enchanting escape. FOOD Best of the Best: Low-Cal Favs. Slimmed-down dishes to savor. HOME Do-It-Ourselves. Throw a remodeling party! FOOD Sugar and spice and everything naughty and nice. BLISS Spring Spectaular! 2012 Performing Arts Preview. DECEMBER UPDATE Extra Extra! Read all about her! BLISS Upcoming Events. Things to do around the Triangle. FOOD Turkey - The Day After. A healthier way to gobble. BLISS Hit Us With Your Best Shot. Winners of our annual photo contest. HOME Nuts About Mutts. Pups get a new leash on life. FOOD The Great Pumpkin. Our Facebook fans dish on jack. FASHION All Dressed Up and Everywhere to Go! BODY 7 Tips to Make You Smile! They're quick and easy...really! HOME Oh, Baby - Pt. 2! Hip, design-conscious gear for the new kid on the block. HOME Oh Baby! Hip, design-conscious gear for the new kid on the block. EATS Picnic-Perfect Desserts. Sugary confections for the charitable heart. HOME A splashy office makeover. EATS Moose Tracks. Maine's North Woods: Lakes, Lodges and Whoopie. SPRING LOADED PART 1: Glam Goes Bold. EATS Nothin' but Net. We've Got the Hoopla. HIP 'HOODS Raleigh's Five Points. For the perfect afternoon. EATS Nouveau Southern. Valentine's Day dinner from Watts Grocery. STYLE Fun, Fresh & Fabulous. How to fulfill your fashion resolutions. EATS Duke Diet Chef Spices It Up. Body-conscious dishes for the good life. BODY Naughty or Nice. 50 Good-for-you Gifts That Keep on Giving. EATS A League of Their Own. Raleigh's Best Bites. HOME How to Survive a Remodel: Start with the right contractor! EATS Gobble! Gobble! Thanksgiving feast with a twist. HOME Dwell Well. Using an architect - no matter your budget. EATS Juicy! Apples go from soup to nuts. STYLE Red Hot for Fall. All that glitters this season. EATS Gastronomes of Garlic, Unite. Take a whiff! ARTS PREVIEW HOT TIX! Triangle lineup: Lady Gaga to Lady Antebellum. HOME Burning Passion. From toasters to stoves, antique appliances are red hot. SAVVY School's Out...Now What? Don't let your brain get bored. EATS Fab Nights, Grilling Delights! Delish dinners outside the kitchen. STYLE Get Glam. Lavish treatments to make you beach-ready. EATS From Farm to Fork, We're Cookin! Locavore scene here has deep roots. JUNE UPDATE What's She Doing? News about women in the Triangle. STYLE Keep Your Cool in the Heat. Hair & makeup for summer. HOME Grow What You Eat. Gardening for Gourmets. MAY UPDATE What's She Doing? News about women in the Triangle. STYLE A Declaration of Spring. statement pieces steal the shows: Part II. HOME What's Up Doc? Tails are wagging at NCSU vet school. SUCCESS The Write Words. Moving stories win annual prizes. APRIL UPDATE What's She Doing? News about women in the Triangle. STYLE A Declaration of Spring. Statement pieces steal the shows. FOOD Ciao Bella! Say hello to beautiful pizzas. MARCH UPDATE What's She Doing? News about women in the Triangle. HEALTH From the Heart. Getting the pulse. FOOD Raising the Bar. Candy stars in decadent desserts. FEBRUARY UPDATE What's She Doing? News about women in the Triangle. SUCCESS Exercise Financial Smarts. Five questions to ask before joining a gym. FOOD Your Faves Slimmed Down. Give the little devil a halo. HEALTH The Skinny on Scaling Back. How to win at losing. JANUARY UPDATE What's She Doing? News about women in the Triangle. SUCCESS Secret Santa. Making your gift count. HEALTH Chill Out. How to thaw holiday stress. DECEMBER UPDATE What's She Doing? News about women in the Triangle. FOOD Sweet Potatoes Cut Loose. Doing the tuber twist. HOME Mi Casa es su Casa. Creating a Haven for Houseguests. HEALTH Hit Me With Your Best Shot. Women often skip life-saving vaccines. NOVEMBER UPDATE What's She Doing? News about women in the Triangle. FOOD Chefs of the Triangle. Sumptuous dishes from the new book. BLISS Hot Pix! Carolina Woman's 2009 Photography Contest Winners. OCTOBER UPDATE What's She Doing? News about women in the Triangle. FOOD Taste of Asia. Easy-does-it main dishes. STYLE All in the Details. Fall Fashion from NYC Runways. SEPTEMBER UPDATE What's She Doing? News about women in the Triangle. SUCCESS Big Shots! Remarkable graduates of Triangle colleges. AUGUST UPDATE What's She Doing? News about women in the Triangle. FOOD Thrill to Grill. The Ultimate Summer Sizzle. JULY UPDATE What's She Doing? News about women in the Triangle. FOOD Cold Comfort. The Scoop on frosty desserts. HOME Road Trip. What's new in North Carolina. STYLE The Shape of Spring. Bold, Confident, Optimistic. BODY Easy on the eyes. Why a little scratchiness may be much more. FOOD currying flavor. spice it up! BODY woman smile big in survey. Sink your teeth into these stats. FOOD I heart brunch. lose your heart to mediterranean chow. BODY a tale of two thyroids. Women get thyroid disease more than men. FOOD The Skinny on Comfort Food. Say Yes to Diet No-Nos. BODY Resolved '09. Our Get-Real Goals. FOOD A Tasteful Affair. Eat, Drink and be Merry. BODY A Healthy Twist on Traditions. Tipping the Scales in Your Favor. FOOD Talkin' Turkey. Side Dishes to Gobble Up. BODY Love the Skin You're in. Even During Winter. FOOD Dessert as Easy as Pie. The Inside Scoop on Pumpkins. BODY Breast Cancer Awareness. Creating Hope and Understanding. FOOD Spice, Rice and All that's Nice. Faves from South of the Border. STYLE Minimalist Luxe. The Fall 2008 Fashion Preview. FOOD Watermelon Goes Bananas. Unique Summer Recipes. SUCCESS Flashback. Why N.C. Didn't give Women the Vote. FOOD Country Cooking. A Summer Dinner. STYLE No Worries Shopping. Buying clothes you'll love. FOOD Strawberry Fields. Sweets that take the cake. STYLE Bling! Why diamonds are a girl's best friend. FOOD When Veggies Party Hearty. Good eats for May shindigs. BUSINESS For Love or Money. Passion on the job. STYLE Spring Escape. Adventures in Global Glam. BUSINESS Gifts and Uncle Sam. The 411 on tax-deductible donations. STYLE Jeans 101. Fit tips for every body. BUSINESS Wake up to your financial goals. MONEY Ready, Set, Go! Kicking off the new year right. HEALTH Bye Bye Blues. Sending holiday stress packing. HOME To Presereve and Protect. Don't let artifacts turn to junk. HEALTH Achoo!. Cold and Flu 101. HOME What Lies Beneath. Foundation problems can be costly to fix. HEALTH Playing with Fire. Why more women could get burned. HOME Small Stuff, Big Impact. A guide to accessorizing. BUSINESS Battle of the Ages. Generational conflicts are bad for business. STYLE Stay Warm, Look Hot. New twists on cold-weather classics. HOME Good As You Think You Are? 10 energy-saving myths. BUSINESS Office Ouch: Adjust your surroundings to stay strain-free at work. HOME Splashing Safe: Keep watch at residential pools. BUSINESS May the Best Woman Win. HOME Hostesses revive salons and the lost art of conversation. BUSINESS Life in the Fast Lane: Work can wait...for a slow vacation. HEALTH The ABC's of D: Benefits of this vitamin go beyond bones. BUSINESS Generation IOU: Young Adults are spending themselves broke. BODY Good Night: Six reasons to get serious about sleep. BUSINESS Sure-fire ways to make your tax refund work for you. HOME Made in the Shade. A lamp's topper can make or break a room. FOOD Good Mornings! Recipes to help you lighten up at sunrise. HOME Holiday Rescue. Shortcuts to help you survive the season. FOOD A Spoon's Best Friend. Recipes for steaming soups and stews. FASHIONSweet Stack. Layering up for fall. FOOD Sugar & Spice. Everything nice for your holiday baking. HEALTH Risk Management. What you can do to beat the breast-cancer odds. FOOD Fast Food. Easy suppers in no time. FASHION Shape Shifters. A new silhouette takes form this fall. FOODMeat Lovers. Recipes for birds, beef and more. BACK TO SCHOOL Lessons in Life. It's never too late to learn new tricks. FOOD A Toast to Summer. Long, cool drinks for hot days. ARTS It's Showtime. 2006-07 Performing Arts Preview. FOOD Fire It Up! You've got a grill...use it! TRAVEL In the Neighborhood. Seeing more sights in the Southeast. FOOD Go Fish. Summertime seafood recipes. TRAVEL Close to Home. Seeing the sights in the Southeast. FOOD East to West. At-home Asian recipes. FASHION Fresh Air. Spring fashion lightens up. FOOD The Brunch Bunch. Recipes for a mid-morning gatherning. FOOD Oodles of Noodles. Classic Italian pasta recipes. CAREER Stuck in the Middle. How to get into the plum positions. FOOD Some Like It Hot. Searingly spicy dishes. TRAVEL Belle Epoque. Luxury meets history in Savannah, Georgia. FOOD Hidden Healthy. Delicious ways to sneak more veggies into your diet. FITNESS Point Break. Nine health resolutions you can actually keep. FOOD Fete Fabulous. Be the toast of your own party with food and drinks. HEALTH Joy to the World. Fighting the stress of the season. DECORATING Deck the Halls. Making a home for the holidays. FOOD Sweet Things. Holiday Baking Recipes. HEALTH Detective Stories. Know your breast-cancer tests. FOOD All Warm Inside. Soups to soothe the soul. FASHION More, More, More. Fall fashion's maximalist moment. TRAVEL Find Your Thrill. Stepping back in time at antebellum Berry Hill. FOOD Love at First Bite. One family's affair to remember with a master chef. EDUCATION Better Late Than Never. More women hit the books...again. FOOD On the Bright Side. Vibrant veggie entrees. ARTS Spotlight on the Triangle. Annual guide to upcoming performances. FOOD Play With Fire. Blazin’ eats for girls who grill. READING Local Girls Make Good. A beach bag full of books from N.C. authors. FOOD Best Dressed. Fancy salads from famous chefs. TRAVEL New York Nights. Turns out the city does sleep...in style. FOOD Spice of Life. Taste Your Way Through Latin America. FASHION Travel Light. Spring goes around the world in one wardrobe. FOOD Southern Hospitality. Party food with a drawl. FOOD Flavor on the Fly. Make gourmet entrees in no time. FOOD Love Potions. Hot Soup Recipes. COUPLES Create-a-Date. Goodbye, dinner and a movie. FOOD Yes, You Can! Good-for-you versions of diet no-nos. HEALTH Get Over It. Is fear keeping you out of the gym? FOOD A Tasteful Affair Food and drinks to make spirits bright. HEALTH Creature Comforts. Pets can benefit body and mind. FOOD Oven Lovin'. Baking the season's best. TRAVEL Out and About. Festivals and celebrations mark fall in North Carolina. FOOD No Reservations. Favorite restaurant fare in your own kitchen. FASHION The Ones You Wear. Why the best things have staying power. FASHION It's Inherited. Fall fashion's senior moment. FOOD Golden Time of Day. Little bites of Mediterranean life. CONTINUING EDUCATION New Tricks. Adults have a lot to learn, too. FOOD The East Side. Recipes with Asian flair. FOOD A New Flame. Grilling goes glam. FOOD Something Fishy. Reel in these seafood recipes. BOOKS Page Turners. Pack your beach bag with locals’ picks. SINGLE LIFE Free Time. Unattached (and lovin' it) in the Triangle. FOOD Memory Lane. A stroll through old-fashioned, Southern fare.